After a visit to the thrift store the other day I found the first volume of Mike Norton‘s Battlepug. 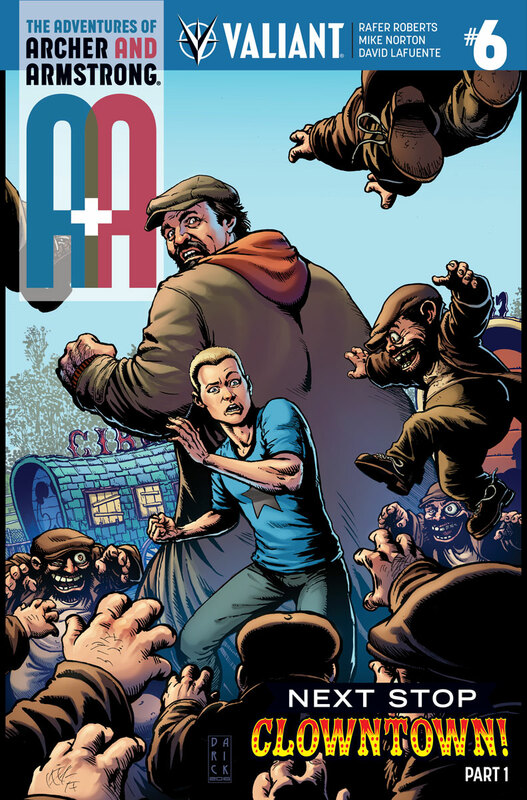 Joining Norton for the comic is colourist Allen Passalaqu and letter Chris Crank. The story itself is a blend between homage and parody to Conan and He-Man in a world where sword and sorcery is the name of the game in a world where giant cuddly and innocent looking (mostly) animals represent a rather unconventionally large threat. With the first volume taking on a story-within-a-story set up, the framing is of a fairly stereotypical fantasy woman telling a bed time story to her two talking pugs. It’s the story within, that bed time story, that holds the origin of the Battlepug as a lone survivor of a village grows to become the Conan figure in all his brutal glory. The book, a slightly oversized hardcover that cost me $6, is presented almost like a children’s book – and because this isn’t a book for kids, that only adds to the brilliance of its presentation. Battlepug is one of those rare stories that is able to both poke fun at and show respect to its genre while exposing the tropes and criticisms that audiences level at classical fantasy. And it does all this with utter seriousness as a giant pug slurps and snorts through the pages. Although there is a very cohesive and well told story here, there are also brilliant little moments every few pages; jokes in dialogue and imagery, nods of the head to other things the reader should be all too aware of, and things that may not necessarily be on their radar (I’m sure I missed a lot, honestly). There’s a much deeper story for you to unpack upon the second or third reading, and it never gets old. Or it hasn’t for me. Norton’s story is utterly fantastic. It’s funny, it’s remarkably well written, and it deserves so much more than the hastily rewritten column that it is getting. It is beyond an Underrated gem, and it’s one that I have every intention of revisiting very soon, and in more detail, when I find the second volume. Rob Bailey is acquiring another magical book with The Occultist Omnibus! In 2010, writer Tim Seeley brought his rare mix of humor, horror, and heroes to Dark Horse’s own Mike Richardson’s magical creation in a popular one-shot, which soon transformed into a popular ten issue, two volume series! Artists Victor Drujiniu, Mike Norton, and Jason Gorder brought Rob Bailey’s adventure to life while colorists Andrew Dalhouse and Allen Passalaqua provide their supernaturally gorgeous coloring skills to the series. The Occultist Omnibus cover is by artist Steve Morris. The Occultist Omnibus collects The Occultist #1-#5 and The Occultist Volume 2: At Death’s Door #1-#5. The Occultist Omnibus follows college student Rob Bailey after he stumbles upon a magical book that gives him supernatural powers; he gets not only new occult abilities, but also dangerous problems that come with them. A gang of hitman mages are sent by a sorcerer who wants the book for himself, and Rob has to learn the ropes of his new powers fast before they can get to him. The Occultist Omnibus goes on sale April 25, 2018. The 256-page trade paperback retails for $24.99. It’s Tuesday which means it’s new comic book day at book stores. This week we’ve got Teen Titans: Earth One Vol. 2. Teen Titans: Earth One Vol. 2 is written by Jeff Lemire with art by Andy Macdonald, Brad Anderson, Allen Passalaqua. The graphic novel is already in comic stores and in book stores today. If you’re reading this review to decide whether it’s worth picking this story up in trade when it’s released, but haven’t yet read any of the three previous issues, then your answer is yes. Yes, this is absolutely worth picking up in trade, because Divinity III: Stalinverse #4 is an incredibly strong conclusion to an already fantastic story. Skip down to the ratings if you want to, because there will be minor spoilers for the story from here on out. Perhaps one of the most interesting aspects to Abram Adams, the original Divinity, is that he’s more interested in solving problems without using his godlike powers – although that preference did result in him losing his head last issue – which gives Divinity a recurring thread that’s quite unlike many other publisher’s major crossover stories of late; that sometimes violence doesn’t solve everything. That’s not to say that there isn’t a climactic battle this issue, but rather that’s not where the comic’s focus is – this is a story about Divinity, and not just another typical superhero fighting miniseries. There’s a spectacular sequence where two characters are having a verbal meeting of the minds, a meeting that’s a fantastic read, but it’s the mind bendingly beautiful artwork of Trevor Hairsine and the rest of the artistic team that elevate the sequence to the next level. If you want an example to show to your friends of a story that exemplifies, and indeed transcends, the comic book medium, then look no further than Valiant‘s Divinity. The overarching Divinity story is the rare story that explores the nature of power and responsibility on a grand scale, while bringing the internal conflict of the three godlike cosmonauts down to a very human level in such a way that enables you to actually empathize with gods. Divinity III: Stalinverse #4 is so much better than I expected it to be – rarely have I read a story that concludes as strongly as this did. Valiant provided Graphic Policy with a FREE copy for review, but as with previous issues, I’ll be buying this myself. A&A: The Adventures of Archer And Armstrong #10 is one of those comics that needs a second reading. The first time through you’ll feel like there wasn’t too much that happened – that there was almost too few words for the art (no, this wasn’t a silent issue) – but the second time you read through it then you’ll begin to notice something. Even though relatively little happens in the story on the surface, Rafer Roberts uses the time to develop Armstrong’s relationship with Gub Gub through some surprisingly subtle ways. Subtle, that is, because they take place in scenes where the focus isn’t on those two, and it’s down to Mike Norton‘s artwork to really bring the relationship building to your attention. It’s easy to gloss over the first time through because you’ll remember a particularly psychedelic scene involving Archer running through some increasingly whacky moments that allow the artist to flex some muscles that wouldn’t be amiss in one of those mind bender paintings. It’s a cool sequence that may drag for some, but didn’t quite seem long enough for me, and at the end of the day that’s kinda how you’ll feel about the issue itself; I quite enjoyed the comic, but it’ll not be for everybody. With only two more issues left Roberts doesn’t have to worry as much about attracting new readers, and instead gets to tell a pretty off the wall story that’s a breath of fresh air. It’ll be a shame when this series ends, but I’m going to cherish every issue till then. Valiant provided Graphic Policy a FREE copy for review. Archer and Armstrong start the issue out by punching a few scientists, as they lament during the fight that nobody will explain what’s happening to them. I kind of hope that they don’t find out because watching them run through a circus trying and failing to reason with people is fantastic. This is a series that’s quite possibly one of the most consistently entertaining comics on the racks month to month, and it’s also a criminally under-read series. Rafer Roberts script, Mike Norton‘s art and Allen Passalaqua‘s colours flow together to create such a brilliantly irreverent story that thinks nothing of throwing some completely unexpected things at both the two lead characters and the people reading the comic (I won’t give you an example because that’ll take away a little of the magic). I ended the last issue’s review by saying “the entire issue is a fantastic middle finger to the type of by the numbers story telling that can be commonplace in comics, but it’s a bird that’s flipped with love – and I enjoyed every page.” The same is equally as true here, and it’s just as fun. There isn’t much more for me to say about this issue (but there is a talking bear! ), other than I really hope you go out and start reading this series. Whether you begin with this arc or not, when you pick up A&A be prepared to find your new favourite comic. Someone has stolen the name Oracle right out of Barbara Gordon’s past! Hot on this false Oracle’s trail, Batgirl, Black Canary, and Huntress are all tracking the same mafia capo…so it makes sense to team up, right? Problem is, Barbara and Dinah need the secrets locked up in Oracle’s brain…and Helena Bertinelli would rather put a crossbow bolt right through it! While Batgirl and the Birds of Prey #1 is good, the comic written by Shawna Benson and Julie Benson feels very paint by numbers in how it plays out storywise. The story follows that rather common trope of superheroes fighting each other before teaming up to stop the real bad guy (in fact it’s so common another DC comics has this same trope this week, but recognizes it and skips the fight). In this issue, which continues the Rebirth launch, we see Batgirl and Dinah trying to figure out who Oracle is while Huntress is hunting down the individuals who murdered her family. Of course their paths cross and they battle a bit until they are forced to team up. It’s very predictable in that way. But what Benson and Benson get down really well is the interaction through all of that. The back and forth between Barbara and Dinah is really good. Barbara’s reactions at time gives the comic some humor in between the action. It reminds me a little of the previous Batgirl volume, though her reactions at time have her working at some points on emotion rather than her logic, a bit of a switch. The art by Claire Roe is pretty good and there’s some fun expressions by Barbara and good action sequences. I think there’s a slight issue with the art showing off a more comedic vibe, but most of the comic is not. There’s definitely a mix of tone throughout the comic, and maybe that’s just first issue jitters by the team that’ll get worked out over time. The first issue isn’t bad in any way, it just is a bit predictable and the tone and interaction between the characters is a bit uneven. There’s potential with these three characters, so we’ll see where it all goes, but the first issue doesn’t knock it out of the park unfortunately. There’s something endearing about Archer and Armstrong. The two polar opposite characters have a friendship that doesn’t need explaining (although it is worth noting that Archer was hired to kill the immortal Armstrong), and the comic opens with a brilliant sequence that will tell new readers all they need to know about the pair: Armstrong farts in Archer‘s face while Archer is meditating. It’s an absolutely hilariously juvenile moment made even better by the way that Mike Norton‘s art and Allen Passalaqua‘s colours come together to create the visuals for the sequence. Rafer Roberts seems to delight in having the two title characters poke fun at existing comic book tropes, before knowingly going along with them leading to some fantastic self-aware moments between the two. I’ve said many times before that this series is one of the most entertaining comics from any publisher, and it’s certainly one of Valiant‘s best comics, but when you see Archer ask he and Armstrong can’t try and talk their way out of the next scrap that will inevitably come their way only to be met with “our enemies are a bunch of idiots. You can’t reason with stupid,” you just know what’s coming. The entire issue is a fantastic middle finger to the type of by the numbers storytelling that can be commonplace in comics, but it’s a bird that’s flipped with love – and I enjoyed every page. A&A’s whirlwind ongoing series is hitting the town with the one and only FAITH! With Armstrong on the road, Archer is taking some much-needed personal time…and bringing his long-distance Romance with Los Angeles’s number-one superhero off of FaceTime and into the real world! As these friends take their relationship to the next level, will romance conquer all? There aren’t many comics coming out that are as fun as A&A: The Adventures of Archer And Armstrong these days, although Valiant did just debut another comic this week, coincidentally starring this month’s guest star: Faith #1. This issue of A&A has Armstrong leaving Archer to his own devices for a few days for a legitimate story reason, although the slightly more jaded among us may see it as Rafer Roberts just setting up Archer as having the time to go to LA to meet his long distance girlfriend. But when the resultant story is this entertaining, who cares where Armstrong went? This is the second comic featuring Faith to hit the shelves this week, and although it’s certainly going to be receiving a lower profile than the debut of Faith #1 (that we reviewed here), A&A The Adventures Of Archer And Armstrong #5 centers around the first actual date between Obadiah Archer, the sheltered young ninja that could give Nightwing a run for his money, andFaith Herbert, the relentlessly upbeat hero known to the world at large as Zephyr. In a ridiculously charming series of events, we see the influence of Faith on the sheltered Archer as the evening progresses, and their talk of pop culture is interspersed with brief snippets of recent (and perhaps not so recent) adventures that took place in various different series – but don’t think you’ll be lost if you’re oblivious of those adventures; the dialogue is so effortlessly done that the details we are given are more than enough to enjoy the scenes. Actually, the story probably works better if you don’t know exactly what has happened in previous issues (although since that’s the boat I’m in, I may be biased), and just allow the comic to bring you along for the ride. This wouldn’t be an Archer and Armstrong comic if something wasn’t punched, and the build up to the inevitable confrontation is incredibly well done, and the resultant fight is genuinely funny; the art is fluid, smooth, and very easy to follow throughout the issue, but it’s the text-planations of Archer‘s fighting abilities (among other things) that are the cherry on top. In an already fun comic, it was often these that had me laughing out loud. A&A: The Adventures Of Archer And Armstrong #5 may not move the overall story along too much, but it’s an absolutely fantastic read. This is a comic that can easily be read as a one shot comic, so whether you’re just getting into Faith and want a double dose this week, or you’ve always wanted to jump into the series proper this is an ideal place to begin. Pick this up before you leave your local comic shop next time you’re in. you’ll not regret it.